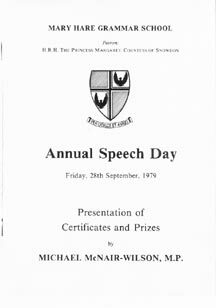 Programme for Annual Speech Day, Friday 28 September 1979. The Chairman of the Board of Governors, Mr. R.W. Holledge, will preside and ask the Principal to present his Report for the year 1978-1979. The Chairman will invite Mr. Michael McNair-Wilson, M.P. to present the prizes and address the meeting. Dr. Elizabeth Dyson, PhD, BSc will propose a vote of thanks to the Guest of Honour. Louise McKenzie, the Head Girl, will propose a vote of thanks to the Chairman and the Governors.